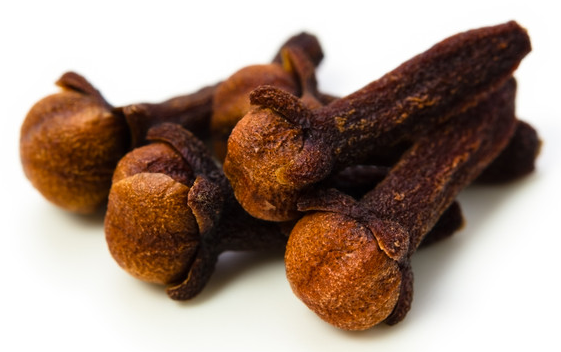 Did you know the word clove comes from the French word clov, meaning nail? Clove essential oil is the oil of boundaries helping people to let go of their victim mentality. Clove can assist us in letting go of regular displays of self-betrayal and emotional reliance on a partner by reconnecting them with their personal strong moral values. Clove gives the pushover the power to say “no”. Each unopened flower bud of the clove tree becomes a clove bud, a tropical evergreen member of the Myrtle family. A clove tree, known botanically as Eugenia aromatica, may live 100 years. They begin producing fruit at seven years and come into full maturity around 25 years. The average crop yield is eight pounds although each year is different. The trees are native to the Moluccas, also known as the Spice Islands. As early as 200 BC, the Chinese used cloves to freshen their breath during audiences with the emperor. During the late Middle Ages, cloves were used in Europe to preserve, flavor, and garnish food. Clove cultivation was almost entirely confined to Indonesia, because the Dutch government had a monopoly on this valuable spice. Later In the 18th century, the French smuggled cloves from the East Indies to Indian Ocean islands and the New World, breaking the Dutch monopoly on this prized spice. Clove has been used for years in dental preparations,candy, and gum for its flavor and ability to promote oral health, yet it provides a myriad of health benefits. Its main chemical component, eugenol, makes it a very stimulating and energizing essential oil that can promote blood circulation and benefit cardiovascular health.Due to its high phenol content, caution should be taken when inhaling Clove directly and it should be diluted when applied to the skin. As a cooking spice, Clove adds a spicy flavor to any dish or dessert while providing internal health benefits. Love this oil but you got to be really careful in using it. Thanks for sharing my passion.